You love taking care of your hair, right? 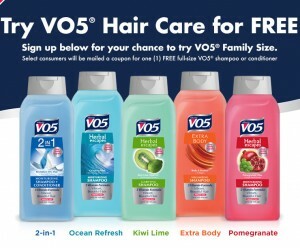 Well here’s how you can get a FREE Full Size VO5 Shampoo or Conditioner Coupon!! Treat your hair the best by simply filling out the form with your name and address information. They’ll mail you a coupon for a totally FREE full-size 33oz shampoo OR conditioner. Don’t hesitate!